Quality of life can be drastically compromised by sleep disorders, and at Boston House we can offer expert help in the screening and treatment of these conditions. Obstructive sleep apnoea, resulting in serious sleep disruption, can produce greatly impaired performance at work, at home, and on the road. Car accidents are statistically much more common in this group. Snoring is a major symptom of a serious medical condition called ‘obstructive sleep apnoea’ (OSA), so careful screening to preclude the presence of this condition will be carried out prior to any treatment being started. Snoring can occur during sleep when the pharyngeal airway (throat) narrows, due to a reduction in muscle tone. Snoring is simply a vibratory noise generated by the back of the relaxed tongue, pharynx and soft palate. ‘Benign’ snoring can be far from benign. The social consequences can be extremely distressing: banishment from the bedroom, marital disharmony, no holidays because of enforced sleep disruption when sharing a hotel room, fear of travelling – falling asleep during long journeys on public transport and the consequent ridicule and embarrassment. Our sleep expert is Dr Aditi Desai whose background in restorative dentistry led her to develop an interest in sleep medicine over the past ten years ago. Dr Desai is currently the president of the British Society of Dental Sleep Medicine. Dr Desai treats patients that suffer from snoring and obstructive sleep apnoea with dental appliances that can modify and enlarge the patient’s airways. The treatment of sleep disorders is tailored to the individual patient and referral to a sleep specialist or ENT specialist is possible if treatments fail to deliver the required results. During sleep, the pharyngeal airway (throat) narrows, due to a reduction in muscle tone. 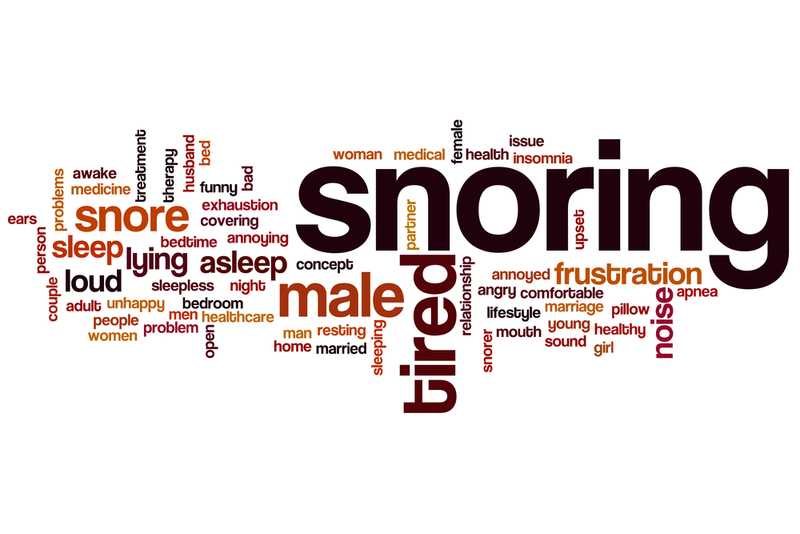 Snoring is simply a vibratory noise generated by the back of the relaxed tongue, pharynx and soft palate. Further narrowing produces not only louder snoring, but also laboured inspiration (breathing in). Finally, further narrowing may cause complete airflow obstruction known as obstructive sleep apnoea. There comes a point where the increased inspiratory effort is sensed by the sleeping brain and a transient arousal is provoked (brief awakening to breathe before returning to sleep). A few of these arousals do not really matter. However, when there are many (sometimes hundreds), sleep becomes seriously fragmented, resulting in daytime symptoms of excessive sleepiness. Snoring and sleep apnoea are part of a spectrum extending from ‘benign’ or ‘simple’ snoring with no sleep disturbance, through to obstructive sleep apnoea with severe daytime sleepiness symptoms and the physiological consequences of recurrent asphyxia (insufficient oxygen). There are many claims made for snoring ‘cures’ or treatments and our understanding of snoring and sleep apnoea has increased enormously in the last ten years. Much can be done to help both these conditions. As a result, there has been an extraordinary rise in the number of hospital referrals for these conditions. ‘Benign’ snoring can be far from benign. The social consequences can be extremely distressing: banishment from the bedroom, marital disharmony, no holidays because of enforced sleep disruption when sharing a hotel room, fear of travelling – falling asleep during long journeys on public transport and the consequent ridicule and embarrassment. Many of the stories we hear are very sad and not worthy of the all too common joking approach to snoring. There is no doubt that treatment is essential for obstructive sleep apnoea and extremely appropriate for snorers. Obstructive sleep apnoea, resulting in serious sleep disruption, can produce greatly impaired performance at work, at home, and on the road. Car accidents are statistically much more common in this group. The response to appropriate therapy can be extraordinarily dramatic with commonly, a return to a state of alertness and vitality often not previously experienced for years or even decades. Is the problem only severe snoring? ‘Benign’ snoring can be far from benign. The social consequences can be extremely distressing: banishment from the bedroom, marital disharmony, no holidays because of enforced sleep disruption when sharing a hotel room, fear of travelling – falling asleep during long journeys on public transport and consequent ridicule and embarrassment. Many of the stories we hear are very sad and not worthy of the all too common joking approach to snoring. There is no doubt that effective treatment is essential for obstructive sleep apnoea and extremely appropriate for snorers. Obstructive sleep apnoea, resulting in serious sleep disruption, can produce greatly impaired performance at work, at home, and on the road. Car accidents are statistically much more common in this group. The response to appropriate therapy can be extraordinarily dramatic with, commonly, a return to a state of alertness and vitality often not previously experienced for years or even decades. There is evidence that so called ‘simple snoring’ is also linked with persistent daytime hypertension, insulin resistant diabetes and carotid artery atherosclerosis. Many now believe that ‘simple snoring’ may be a precursor to OSA. Daytime sleepiness (not tiredness) e.g. nodding off during less stimulating activities: reading, watching TV, meetings, etc. Bed partner reports episodes of breathing cessation (although any snorer will have occasional such events, especially when sleeping supine – ‘on your back’). Patient experiences waking with choking/obstructed episodes. Regularly waking un-refreshed in the morning. Neck circumference over 17″ (usually, but not always, indicates being overweight). Small pharynx (throat) on visual inspection. Waking hearing the ‘end of your own snore’. Having to sleep propped up. Making frequent trips to the bathroom during the night. There is good evidence that custom made intra-oral appliances – mandibular repositioning appliances (MRAs) [variously known as MRDs – D for device] worn in the mouth at night can greatly help reduce snoring. They work by holding the lower jaw and tongue forward during sleep. The narrowing of the airway behind the tongue is prevented thus reducing the likelihood of snoring and even apnoea episodes. MRDs are primarily indicated for the treatment of simple, non apnoea snoring as well as for mild – moderate OSA when prescribed and monitored as part of a multidisciplinary team. APNOEAIC EPISODE (ap-knee-ic) A period of not breathing whilst asleep usually lasting for more than 10 seconds. HYPERCAPNIA (high-per-cap-nee-ah) A raised level of carbon dioxide in the blood. This is the gas normally breathed out. Its blood level rises if breathing is inadequate. Usually measured by taking an arterial blood sample. HYPERSOMNOLENCE (high-per-som-no-lence) Technical expression for excessive daytime sleepiness. HYPNOGRAM (hip-no-gram) The final print out of the all-night sleep stages after an overnight study. (REM and non-REM). HYPOPNOEA (high-pop-nee-ah) A period of underbreathing: usually for more than 10 seconds. HYPOTHYROIDISM (high-po-thy-royd-ism) Also known as myxoedema (mix-ee-dee-ma). When the thyroid gland fails to make enough thyroid hormone. Can present as obstructive sleep apnoea. HYPOXIA (high-pox-ee-ar) When the body is short of oxygen and therefore the level in the blood falls. HYPOXIC DIPS (high-pox-ic) The falls in oxygen levels, seen on the oximeter, that usually accompany apnoeas. Also known as desaturations, because, when not hypoxic, the blood is described as fully saturated with oxygen. INSOMNIA (in-som-nee-ah) Being awake when you want to be asleep. Often thought of as a problem but may not be. Common if people try to spend too long in bed. MANOMETER (man-om-eater) Device to measure the pressure being delivered by a CPAP machine (usually measured in centimetres of water [cm H20] – where a common CPAP pressure is about 10). MICRO AROUSALS Very brief “awakenings”, perhaps only seen when the brain waves (EEG) are being monitored. MOVEMENT AROUSAL These are short awakenings with minor body movements, about which the sleeper is unaware. MUFFLES™ Wax ear plugs. Less comfortable than the foam ones (EAR™) but more effective. From most chemists. NARCOLEPSY (nar-co-lep-si) A cause of daytime sleepiness due to an inherited disorder of the control of dreaming sleep. Has to be differentiated from sleep apnoea, periodic leg movements and other rarer causes of daytime sleepiness. NASAL CPAP (nasal see-pap) The process of delivering a continuously raised airway pressure mask worn on the nose, hence Continuous Positive (as opposed to negative) Airway Pressure. OSAS (obstructive sleep apnoea/apnoea syndrome). Usually made up of 30 or more periods of not breathing when asleep. Each period lasting for more than 10 seconds.